Gongura or sorrel leaves, it is a tropical plant that is edible as is or cooked. It tastes great and is nutritious. So, why is this Gongura so awesome.In Andhra region Gongura pickle is more popular at every home and in hotels, restaurants.Red Sorrel comes in two varieties, one is green leaf and the other being red variety which is more sour than the green/white stem variety.The leaves are bitter and mildly astringent and have a predominantly acidic taste.In these two varieties i am using red variety(Pulla Gongura).Other well known recipes made with Gongura as the main ingredient are Gongura Pappu (Lentils), Gongura mamsam (goat/mutton) and Gongura royyalu (shrimp). In recent times, Gongura Chicken is also being served in restaurants. Heat 2 tbsp of oil in heavy bottom vessel.now add the gongura leaves,saute them till leaves looses its col or and becomes soft.Remove them from vessel and let them cool. Now, add 1 tbsp of oil to the same pan, and then add mustard seed.when mustard seeds splutters add cumin seeds,red chillies,urad dal,coriander seeds,garlic cloves and stir well,fry till they are golden brown colour. Grind these above ingredients with enough salt.Add the fried gongura leaves and grind very coarsely. Heat 4 tbsp of oil in a pan and add mustard seeds, when they splutter, add dry red chilies, crushed garlic, cumin seeds, curry leaves and fry until garlic is slightly brown. Remove the tempering from fire; Let it cool before adding it to the ground gongura pachadi. This pickle requires little more oil,like most of Andhra pickles. Can store in refrigerator for 3 to 4 weeks. 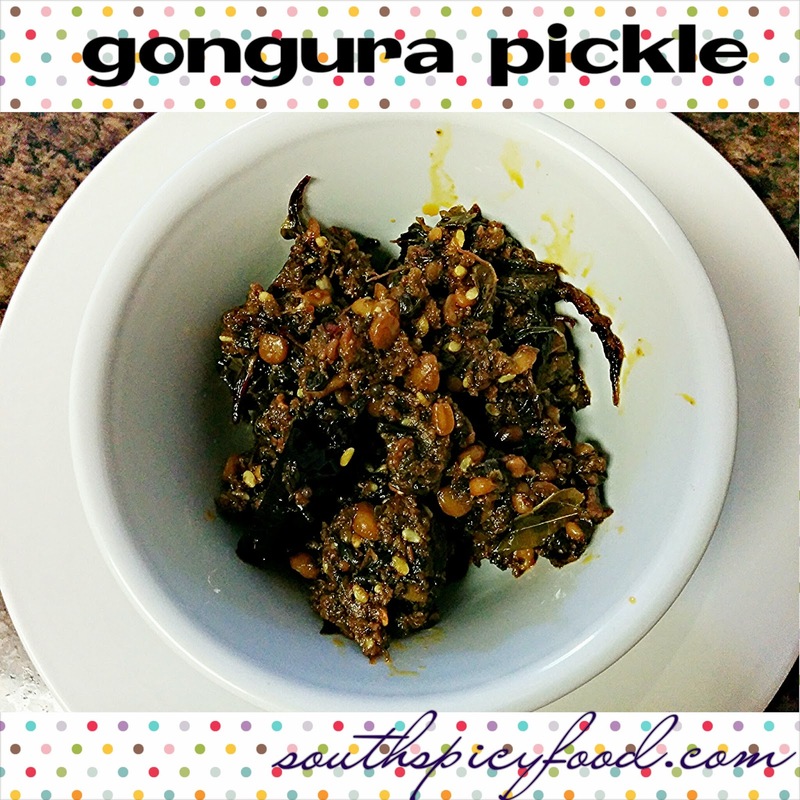 Serve with hot steamed rice and spoon full of ghee.We can also add raw chopped onions to this pickle. Please give your valuable comments and suggestion.Your comments are most precious to me. Thank you very much.